Playing his last innings in international cricket, Alastair Cook has scored a brilliant century in the ongoing fifth and final Test against the visitors India at The Oval (London). On the day four of the fifth Test, Cook started on his overnight score of 46 runs while England began on 114/2. 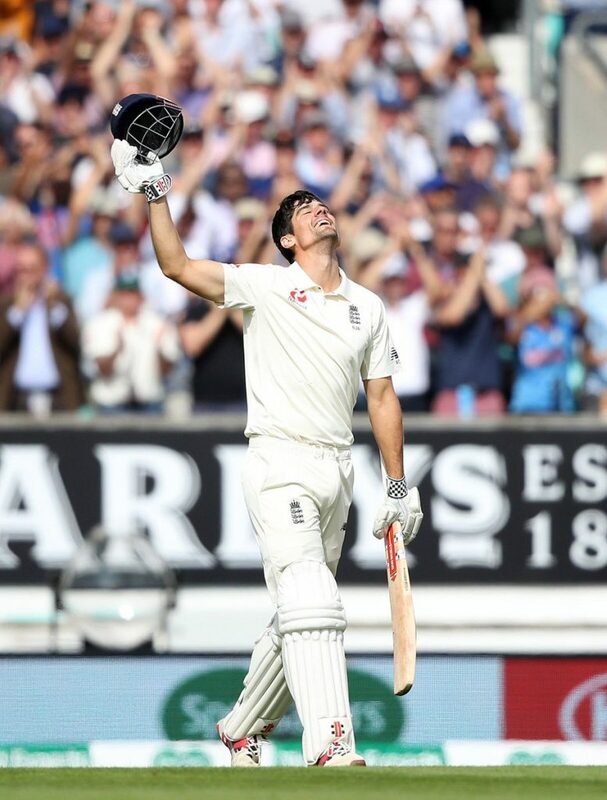 The left-handed English opening batsman Cook, who scored 71 runs in the first innings of this Test, started the day brilliantly to complete his half-century at first and then stretched his innings to century. Cook completed his 33rd Test century and 38th international cricket century in 210 balls with 8 fours. Moreover, he becomes the leading Test run-scorer as a left-handed batsman after surpassing the former left-handed Sri Lankan batsman Kumar Sangakkara (12,400 Test runs). At the lunch on day four, Cook remains unbeaten on 103 runs as England has scored 243/2 with the lead of 283 runs. Currently, England seems in very strong position in this game and surely Cook and the other batsmen will put more runs on the scoreboard. Alastair Cook becomes the leading Test run-scorer as a left-handed batsman. He surpassed the previous record holder Kumar Sangakkara (Sri Lanka) who had scored 12,400 Test runs. Yes chef #LEGEND so pleased for him. Alastair Cook #alistaircook scores a century in his final innings for England. You could not have written a better script!! I’m happy for Alastair Cook for scoring a century in his final Test innings but sad to see him retire at age 33.